When I say something is easy, I mean it is E-heehee-heee-hee-EAAAAAAAAAAAS-ayyyyyyy. Know this. And when I tell you that this Easy TexMex Lasagna is almost ridiculously easy, please believe me. All it takes is some leftover pulled pork (like this, this, or heck- even leftover chicken, like this), some salsa and/or taco sauce, some cheese, some frozen corn, some drained and rinsed black beans, and a box of oven-ready lasagna noodles. Okay, maybe TWO boxes of oven ready lasagna noodles if you’re gifted at choosing boxes of broken noodles or have 5 sons who play hacky sack with your boxes of oven ready lasagna noodles. Hypothetically speaking. Now that we’ve established that Easy TexMex Lasagna is -indeed- easy, let’s talk about why that matters. In a nutshell, it matters because this is one killer dinner that took lasagna from a hated food (Who has kids that hate lasagna anyway? I DO. Weirdos. Good thing they’re cute.) and put it firmly in the beloved dinners category. That’s right. They scarfed up an entire pan of lasagna in less than 24 hours. Teen boys are good like that. 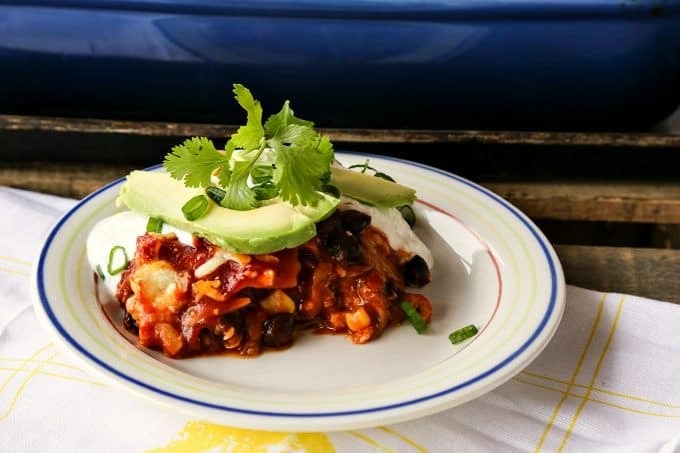 I can’t blame them, because this Easy TexMex Lasagna was simply layers of their favourite taco fillers -succulent pulled pork, tender pasta, tangy and spicy salsa, sweet corn, black beans, and three different cheeses baked together to melty perfection. We are talking about what the love child of a taco and lasagna would be. How could that possibly be bad? I know there are a lot of “Mexican” lasagnas out there made with corn tortillas instead of lasagna noodles, but my kids never dug those. The soft and grainy texture of the corn tortilla after baking in and amongst meat, sauce, cheese, and beans did not ding their chimes. Using the tremendously convenient oven-ready pasta (NO BOILING, MES AMIES!) made the dish both lightning fast to assemble and more appealing to my fellas. In the video, I use Ronzoni Oven-Ready Lasagna sheets. I know Barilla also makes a version of this. I have not tested the recipe with fresh lasagna sheets (although I suspect it would work well), nor have I made it with boiled noodles. 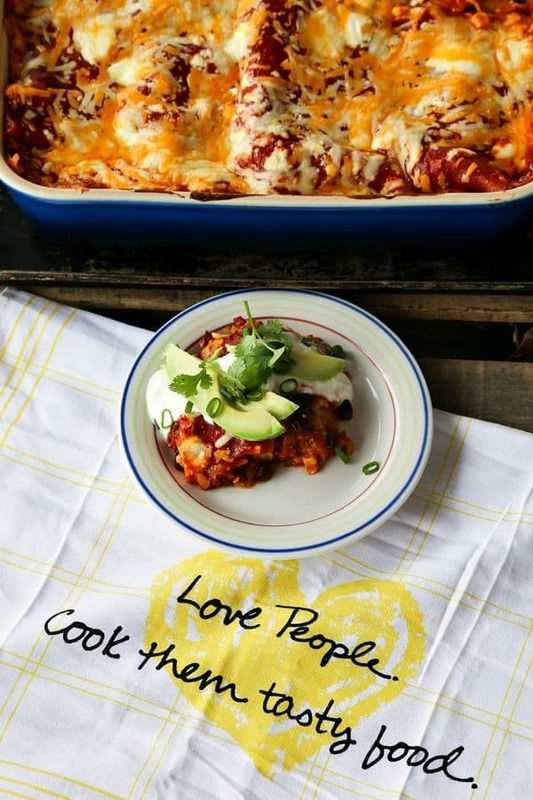 Do thaw your corn before layering it into your Easy TexMex Lasagna. I know all of the ingredients (except the oven-ready lasagna noodles) are fully cooked, but frozen corn will make the whole works take longer to bake. Who wants to wait extra long just because of corn? Not this girl. Do drain and rinse your black beans, too. All that extra bean liquid will serve not only to make a soggy lasagna, but it’ll be ugly to boot. Black bean liquid ain’t purdy. Let’s talk sauce. In my video, I use both salsa (homemade) and taco sauce (purchased). You can use any combination of those two ingredients, but you just want to be sure you have a total of 5 1/2 cups of sauce, whichever you use. Now cheese. I almost always advise folks to grate their own, and I’m not going to deviate from tradition for the Easy TexMex Lasagna. It just melts nicer than the pre-grated stuff does. That being said, if all you have is pre-grated, do it up. Types of cheese? I used equal parts-ish of Monterey Jack, Extra Sharp Cheddar, and Queso Fresco (handily available at Aldi!). If you can’t find Queso Fresco, you can substitute with more Monterey Jack or pepper jack, or Queso Asadero or even mozzarella! The main thing to keep in mind here is that no matter how many cheeses you mix together, you want to end up with between 1 1/2 to 2 pounds of cheese. The pan used in the video is a Le Creuset Heritage Baking Dish, but you can use a 9 x 13 baking dish in its place if you’d like. You may have to work a little to get all the ingredients tucked in, but it should work! Alternately, a lasagna pan would do a great job! Shocking, right? 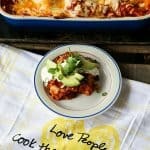 Easy TexMex Lasagna: Succulent pulled pork, tender pasta, tangy and spicy salsa, sweet corn, black beans, and three different cheeses baked together to melty perfection. 1 1/2 to 2 pounds grated cheese any combination of Monterey Jack, Cheddar, Queso Fresco, or more. See Cook's Notes. Preheat oven to 350F. Lightly spray a 9 x 13 baking dish or a heritage baking dish with spray olive oil. Pour 1/2 cup of salsa or sauce over the bottom of the pan. Place down one layer of lasagna sheets, breaking extra sheets to fill any gaps. Toss 3/4 of a cup of cheese over the pasta. Scatter about half of the pulled pork, corn, and black beans on top, then toss on another 3/4 of a cup of cheese. Drizzle on another 1/2 cup of the salsa or sauce. Add another layer of pasta, alternating the direction you lay the sheets down. Again, break and use extra sheets to fill in the gaps. Drizzle another 1/2 cup of salsa or sauce over the pasta. Toss 3/4 of a cup over the sauce, then scatter the remaining pork, corn, and black beans over it. Top with another 3/4 cup of cheese. Drizzle another cup of sauce or salsa over the contents of the pan. Layer one final layer of pasta sheets, filling in any gaps with broken pasta sheets. Pour the remaining salsa or sauce over the top and spread to be sure no pasta is exposed. Scatter the remaining cheese over the top. Spray a piece of foil with spray olive oil, then place oiled side down and crimp around the edges. Bake for 30 minutes, remove the foil, and bake another 15 to 20 minutes, or until the sauce is bubbly, the cheese is fully melted, and there is light browning at the edges. Let the Easy TexMex Lasagna cool for at least 5 minutes before slicing. 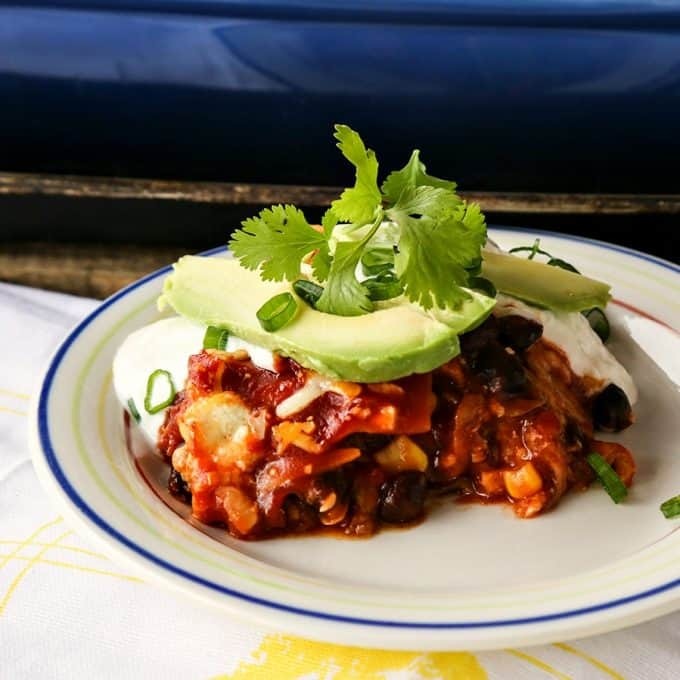 Garnish Easy TexMex Lasagna with sour cream or Greek yogurt, avocado slices, chopped green onions, and fresh cilantro, if desired. Tasty! i’ve added also a dash of bacon!